20 Toes Photos Can Regy Thorpe and the rest of the Knighthawks capture that second title in 2007? As the Rochester Knighthawks practiced on one of the indoor turf fields at All Star Sports Arena in Irondequoit last month, Kris Clarke sat right up against the fiberglass that ringed the field and watched the players go through their paces with coach Ed Comeau. A fan since 1999, Clarke was decked out in a K-hawks hat and sweatshirt, and he had come to All Star Sports to see what type of team would take the field in 2006-07. "They're good," he said. "But that's on paper. They have talent, but every year they have talent." That the Knighthawks are perennially strong is a given in Rochester; the team has made the National Lacrosse League playoffs in all previous 12 seasons of the franchise's existence. But despite all those trips to the post-season, the Knighthawks just have a single title, in 1997, to show for it. Like many K-hawks fans, Clarke is hoping the 2006-07 season will be the one in which the team finally breaks through and claims its second NLL title. "That's the goal," he said. He isn't the only one heaping expectations on this year's team: Inside Lacrosse put the Knighthawks at the top of the magazine's preseason power ratings. Such praise might be well deserved; the K-hawks will hit the turf with a high-powered offense led by superstar John Grant and a stingy defense in front of dependable goalie Pat O'Toole. But while fans and pundits are buzzing about the possibilities, the Knighthawks themselves are trying to block out all the predictions of greatness. "We don't look at it like that," says veteran defenseman and Penfield native Chris Schiller. "We don't read those articles. The proof is in the pudding. We have to win [the title]. We have to prove to ourselves that we can do it." Adds Comeau: "We prefer to be the best at the end of the season." After the team lost to Buffalo in the semifinals in 2006, the organization took several steps in the off-season to ensure that it doesn't come up short again. The Knighthawksnamed O'Toole their franchise player after the 13-year veteran led the NLL in saves in 2006, and the team drafted UMass defender Jack Reid with the No. 10 pick in the NLL draft. The Knighthawks also re-signed two key offensive players, Scott Evans and Mike Accursi, as well as stalwart defenseman and four-year team captain Mike Hasen, and they acquired solid backup goalie Mike Miron. "We still have some work to do, but we may have gotten better in the off-season," says defenseman Pat Dutton, a Webster native. "I think we'll be right there at the top [of the league]. The team is becoming more mature every year, and the younger guys are growing into leadership roles. Everyone is learning from the mistakes of the past." Dutton says that while the K-hawks have "the best defense in the league" and one of the NLL's highest-scoring offenses, the team needs to bolster its transition game, both offense to defense and defense to offense. A key to the team's success will be its ability to turn defensive stops into offensive fast breaks and prime scoring opportunities. "We've got to step it up," Schiller says. Comeau says the K-hawks' offense needs to be more creative and "make good decisions without forcing things. Our defense works hard to get the ball to our offense, so we have to make good decisions on offense." In general, the coach added, every player needs to know his role and play it well. "We have an exceptional defense, and we have an outstanding offense," he said. "If we play in the manner these guys are able to play, we'll be successful." But, he added, the competition from the rest of the league will be stiff. "We know we have a good team, and we have a lot of potential," he says, "but there are a lot of good teams in the league." Comeau noted that the K-hawks played eight one-goal games last season, which he believes is proof of the parity in the NLL. The Knighthawks opened the season with a loss to defending champion Colorado on Saturday, and will travel to San Jose this weekend before hosting Toronto in the January 13 home opener. One game certainly won't determine the outcome of an entire season, and regardless of the Knighthawks' loss last weekend, the team knows it has to be consistent to claim a crown. "We're strong all around," Schiller says. "We just have to put it together and play four quarters of great lacrosse." If the K-hawks can do that, then the team just might win that elusive second title and, as Dutton says, "get this monkey off our backs." 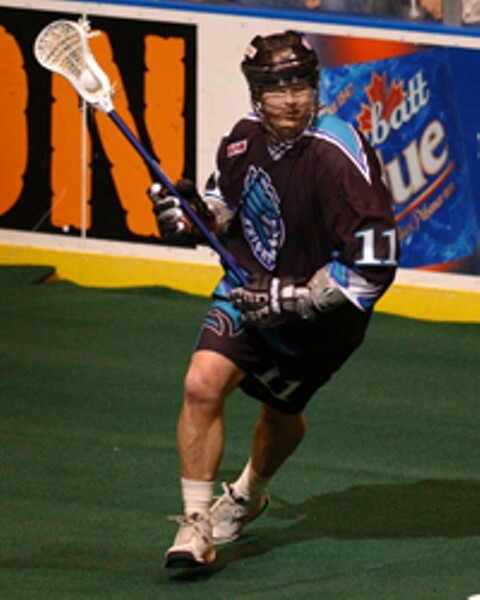 The Rochester Knighthawks2007 home opener takes place Saturday, January 13, at 7:35 p.m. against the Toronto Rock at Blue Cross Arena. Tickets can be purchased at the BCA box office, through Ticketmaster, or by calling 232-1900. For more information go to www.knighthawks.net.